This paper presents the application of multi scale techniques to the simulation of sheet metal forming using the one-step method. When a blank flows over the die radius, it undergoes a complex cycle of bending and unbending. First, we describe an original model for the prediction of residual plastic deformation and stresses in the blank section. This model, working on a scale about one hundred times smaller than the element size, has been implemented in SIMEX, one-step sheet metal forming simulation code. The utilisation of this multi-scale modeling technique improves greatly the accuracy of the solution. 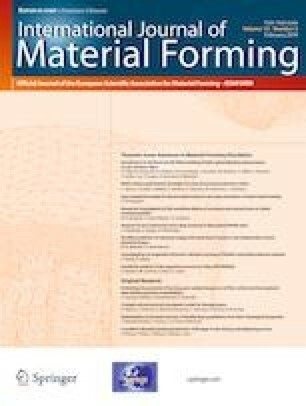 Finally, we discuss the implications of this analysis on the prediction of springback in metal forming. The author would like to thank the RENAULT participants to MACARENA project (in particular Mr. Pierre LORY) for their cooperation. Part of the work presented has been carried out within the framework of the RNTL MACARENA project (grant number 02 4 93 0305). The support of the French Ministry of Industry is dutifully acknowledged.